The Bunburyist: Clues 33.2: Patricia Highsmith, Per Wahlöö. Forgery is a recurrent theme in Patricia Highsmith’s work, both as a transgressive act and a metaphor for transformation. Positioning the films within their socio-historical context, the essay will examine the ways in which Tom Ripley is reconstructed or “forged” in the adaptations of Highsmith. The Criterion edition of René Clément’s Plein Soleil/Purple Noon (1960) gives vivid life to the French adaptation of Patricia Highsmith’s The Talented Mr. Ripley (1955). The script by Clément and Paul Gégauff retains the author’s moral ambiguity but eschews the character’s abjection and its related sexual ambiguity for a vigorous and untroubled heteronormativity. A study of the amusement-park sequence in Strangers on a Train (1950) reveals that Patricia Highsmith should be recognized as a founder of “dark carnival” writing, a subgenre of suspense and horror fiction that emerged during the second half of the twentieth century. 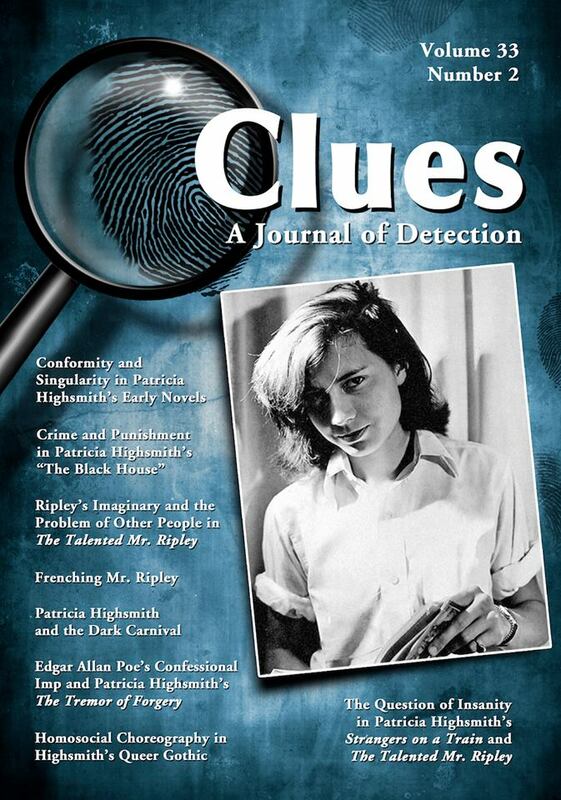 This article discusses how Patricia Highsmith reworks dynamics from Strangers on a Train, including redirection of a scene from Edgar Allan Poe, to support Howard Ingham’s rejection of conventional judgment in The Tremor of Forgery. Ingham’s experiences, the author argues, anticipate Highsmith’s last novel, Small g.
Many of Patricia Highsmith’s plots are versions of what Eve Kosofsky Sedgwick calls the gothic “reversible male chase.” Focusing on The Two Faces of January and Those Who Walk Away, this essay explores how Highsmithian homosociality exposes the empty reflexivity of late–twentieth-century existence. This essay examines Timothy Porter’s death in Patricia Highsmith’s “The Black House” as a symptom of violated gender norms in the public and private spheres. The article also examines Tom Ripley’s murder of Dickie Greenleaf in The Talented Mr. Ripley, considering whether it is space itself or a violation of gender that influences this act of violence. When Swedish crime writer Per Wahlöö died in 1975, he and his writing partner, Maj Sjöwall, had barely managed to finish their final novel, The Terrorists (1975). Following the recent discovery of Wahlöö’s last notes from his deathbed, previously unknown to the public, the author explores Wahlöö’s plans for an 11th Martin Beck novel.